The historic New England village of Dorset has actually elected a living, breathing "woman" as its First Selectman. And now she's about to undertake the Historic District's biggest public works project in a generation the widening and re-grading of Dorset Street. The job has needed doing for ages but the previous First Selectman, Bob Paffin, always opposed it. So did a lot of Dorset's blue-blooded old guard. The long put-off dig uncovers a body buried underneath the pavement in front of the Congregational Church. It belongs to Lt. Lance Paffin, Bob Paffin's older brother, a dashing U.S. Navy flyer who went missing off his sailboat the night of the country club's spring dance more than forty years ago. Everyone had assumed he just left town. But now it's clear Lance has been under Dorset Street this whole time, and that he was murdered. Des and Mitch soon discover that there are deep, dark secrets surrounding Dorset's elite, and some very distinguished careers have been built on lies. 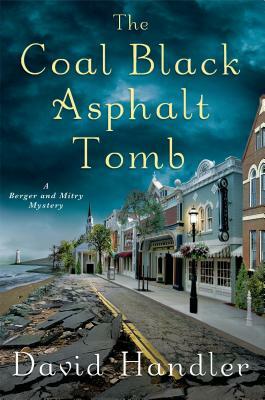 "Coal Black Asphalt Tomb" is the tenth in David Handler's original and very funny Berger and Mitry mystery series featuring this engaging biracial couple. DAVID HANDLER is an Edgar Award winner and Anthony, Derringer, and Dilys Award finalist. He has written extensively for television and films. David is the author of Runaway Man, Snow White Christmas Cookie, Blood Red Indian Summer and Shimmering Blond Sister. He lives in a two-hundred-year-old carriage house in Old Lyme, Connecticut.